You know we love our Zionsville goodies, right? We know you love them, too! 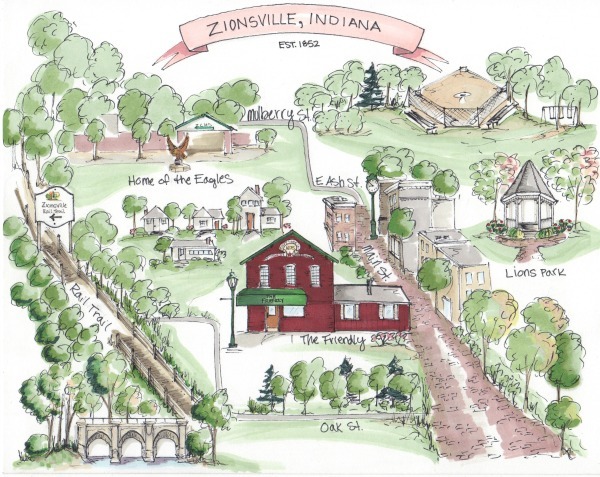 So, we are thrilled to introduce our newest Zionsville items: an 8X10 framed print of this drawing of Zionsville and a set of 5 notecards with five different scenes. When people ask about the “style” of our store, I always pause before answering. We have so many different styles and have since we opened almost 5 years ago! I love rustic and I love fancy French and (most) everything in between. 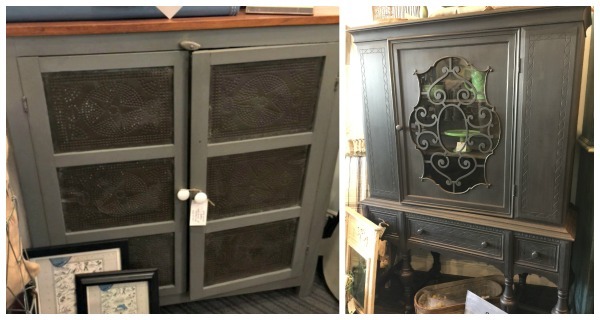 This pie safe was painted in Miss Mustard Seed’s Milk Paint in Trophy and is obviously quite rustic. From the wood top to the tins to the white knobs, everything about this piece says “Farmhouse”. The china cabinet, in MMSMP Typewriter, has a more refined and formal look. The glass, those legs and the casters give it a more traditional feel. Well, we are sticking with it – and we are thrilled our paint line helps us achieve both looks! before and after: hey, haven’t I seen you somewhere before? And, be sure to checkout their new look and updated menu — I still love Liz’s Signature Salad, you just can’t go wrong! 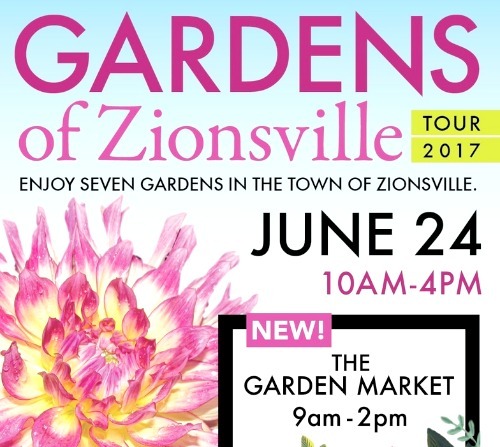 June 17, 12:00 pm, Main St. Zionsville (public event). 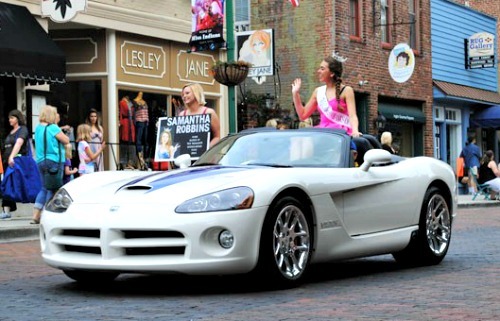 Miss and Teen Contestant Autograph signing at Boone Village, 12:45 pm (public event). Miss Indiana and Miss Indiana’s Outstanding Teen Finals, 6:00pm at the Zionsville PAC (Ticketed public event). If you have questions or need assistance, please email tickets@missindiana.org. June 24, 10am to 4pm. For tickets and more information visit the Sullivan Munce website. June 24, 9am to 3pm. 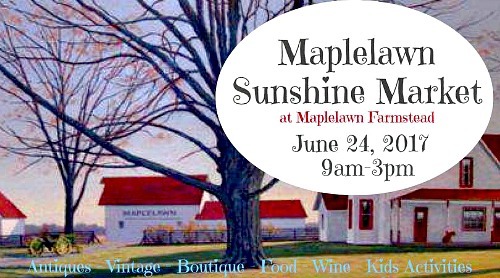 Maplelawn Farmstead, a Depression Era living history museum is hosting their first annual outdoor market this summer. Featuring antiques, boutique clothing, kids items, vintage sellers, crafts, food, wine and kids activities. Come shop the farm! For information visit the Maplelawn Sunshine Market Facebook page. Fivethirty Home will be closed this Sunday, June 18th for Father’s Day. It’s one of our new favorite combinations, MMSMP Layla’s Mint with a white wax finish, to try on tables, chests of drawers and nightstands. It is a soft, dreamy look perfect for bedroom furniture, living room furniture and everything in between! I was completely obsessed with how this piece turned out. It was a little sad (and dirty – ew!) before we gave it a quick clean with our new favorite, Dirtex, and two coats of Miss Mustard Seed’s Milk Paint in Tricycle. Finished with a thick coat of our Antiquing Wax and a rope pull, it has gone to a new home where we hope they love it as much as we did!! We finished this cute bookshelf in just a few hours in the store. I love the look of white wax and MMSMP schloss, our taupe/gray color. We sold it out of the back room, but0707 I am thrilled to report we are just finishing a whole bedroom suite in this combo — stay tuned! If you’ve heard my story and how I started furniture painting, you know I used to stencil quite a bit. When my kids were younger, I stenciled trains and names, music notes and ABC’s. When I stenciled things for our home, I would use a paisley or damask or a “C” for our last name. Sometimes the speed with which pieces turn over at the store prohibit me from taking the extra time to stencil furniture. I decided to slow it down and throw it back with these two pieces (and was happy I did because they have already found new homes!). Both pieces were painted using Miss Mustard Seed’s Milk Paint in Typewriter and I used a metallic paint, a stencil creme, for both.